Stephen Altoft plays Feldman's "A Very Short Trumpet Piece"
Photo by Siegfried Meckle Feldman's "A Very Short Trumpet Piece" is dated 17th May 1986. His publisher, Universal Edition, had asked him to write something for an album they were compiling entitled Fanfares - New Trumpet Pieces for Young Players (UE 19060). The album was published in 1989, two years after his death. He never heard the piece performed. 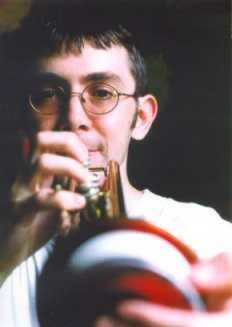 Stephen Altoft is dedicated to the creation of new repertoire for the trumpet. His experience encompasses a variety of music which has taken him to venues and festivals across Europe, the United States and Canada. As well as his programmes with electronics, he has played for the Kammersinfonie Berlin, the Cornelius Cardew Ensemble, Klangforum Wien and with duo Contour. Stephen studied trumpet at the University of Huddersfield, England (1991-5) from which he gained a Masters degree and the Ricordi Prize for Contemporary Performance. This was followed by periods of private study with Markus Stockhausen (Cologne: between 1996-8) and, with assistance from the Music Sound Foundation, with William Forman (Berlin: 1998-1999). The audio file below contains a recording made by James Saunders during a concert at St Cyprian's Church, London, UK, on 8th June 2000. Thanks to Stephen Altoft and James Saunders for agreeing to make this performance and recording available here.